Recently released footage claims to show a Tasmanian tiger in the wild, even though the last known living member of the species died in 1936. A video from the BRT Team, a group that attempts to track Tasmanian tigers, also known as thylacines, believes that they have footage depicting one of the tigers in the wild, reports The Mercury. The video was shot in the Tasmanian bush in November 2016 by Adrian Richardson, Greg Booth and his father George Booth, members of the BRT Team, but only recently released. The cameramen are keeping the location of this sighting a secret to prevent others from disturbing the animal. The thylacine trackers believe the footage shows one of these Tasmanian tigers walking slowly at a distance, putting its nose at the camera lens, and walking with a cub. 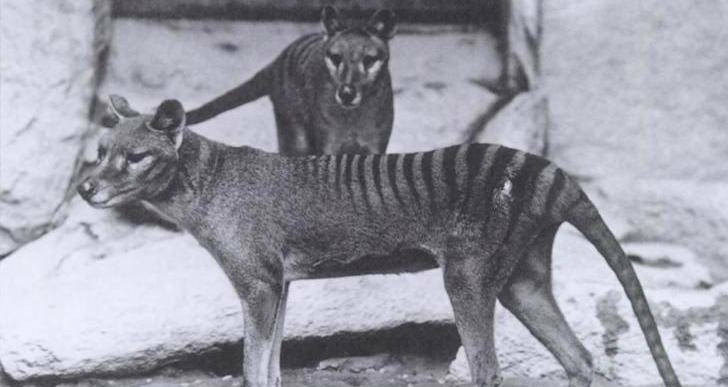 “I don’t think it’s a thylacine…I know it’s a thylacine,” said Richardson of the BRT Team. In a report released about this video, retired wildlife biologist and Tasmanian wildlife expert Nick Mooney explained that he believes the chances that at least some of the footage depicts an actual thylacine are about 30%. “Based on this limited analysis of the film, there is perhaps a one in three chance the image is of a thylacine,” estimated Mooney. Those are good odds for an animal that was declared officially extinct 36 years ago. The Tasmanian tiger, or thylacine, was a large carnivorous marsupial that was native to Tasmania as well as mainland Australia. It was dog-like in appearance with dark stripes radiating down its back. After Europeans colonized Australia and Tasmania in early 1800s, they began killing off the thylacines who would frequently attack their sheep. By the 1930s, humans had killed off all those left in the wild, and only a few of the species remained in captivity. The last captive thylacine, named Benjamin, died in 1936 at the Hobart Zoo in Australia. After 46 years with no sightings of the species, the Tasmanian tiger was declared extinct in 1982 by the International Union for Conservation of Nature. Next, learn how tiger populations are rising for the first time in a century. Then, read about the many projects being taken to bring back extinct animals like the Tasmanian tiger.